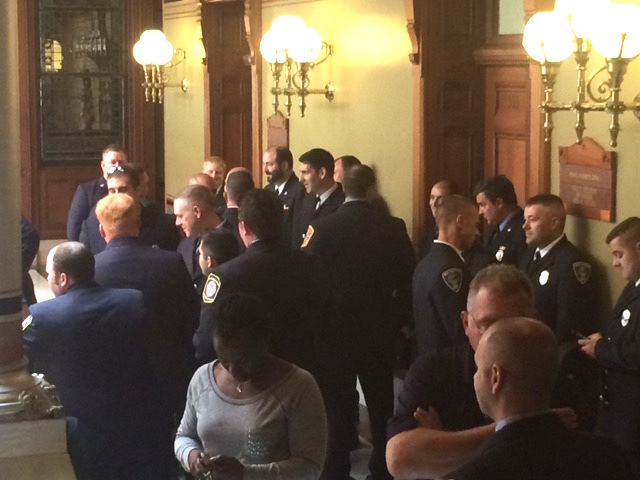 Firefighters crowd the halls outside the Senate on Thursday. 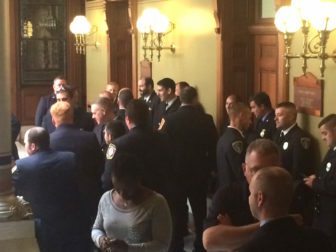 The Senate voted 25 to 11 early Friday for legislation expanding workers’ compensation for police and firefighters, overcoming complaints that the new unfunded mandates would be financially ruinous to cities and towns in Connecticut. The bill would require coverage for post-traumatic stress suffered by police responding to certain types of fatalities, a change inspired by the school shooting at Sandy Hook; for firefighters, many types of cancer would be declared an occupational hazard. The measure is a combination of two bills: mental-trauma legislation from the Senate and a firefighters’ cancer bill that is stalled in the House while labor tries to win over some GOP lawmakers. “We’re pleased to support this bill because it does recognize the unique conditions under which our first responders work and the unique challenges that they face,” said Senate President Pro Tem Martin M. Looney, D-New Haven. Passage would be a major victory for organized labor and a bitter defeat for municipalities, whose lobbying groups say they were shut out of whatever talks led to the revised legislation, announced Thursday in a room packed with uniformed firefighters. “No mayor or first selectman was part of the conversations in combining the two proposals, which is particularly disconcerting about the process for this bill,” said Robert Labanara, director of public policy for the Connecticut Conference of Municipalities. House Republicans, who had been working on a compromise for weeks, also say they were blindsided by a deal largely crafted by Senate Majority Leader Bob Duff, D-Norwalk. Rutligliano’s anger, if it reflects the wider view of the Republican minority, could be problematic. With less than two weeks left in the session, the GOP can restrict the flow of business simply by prolonging debates. Once legislators return Tuesday after the long Memorial Day weekend, the General Assembly will have only nine potential session days before the midnight adjournment June 3. The bill passed the Senate with the support of every Democrat and four of the chamber’s 15 Republicans. At least four other GOP senators indicated a willingness to vote for the cancer benefit, but not the post-traumatic stress provision. Sen. Cathy Osten, D-Sprague, said the medical profession has clear standards for a diagnosis of post-traumatic stress, something that is recognized in treating veterans. “I think that this amendment starts to recognize that mental health should have parity with medical health. It’s a necessary thing for us to address,” said Osten, who was a correction officer and supervisor for 21 years. Efforts to split the bill failed. Rick H. Hart, the political director of the Uniformed Professional Fire Fighters Association of Connecticut, said he believes the revised bill could pass with only Democratic votes in the House. Ten days ago, he said passage would require some GOP support. Workers’ compensation reimburses workers or their survivors for wages lost because of death or disability, whether permanent or temporary. It would cover the state’s 4,000 professional and many of its 22,000 volunteer firefighters. While all volunteers originally were to be covered, the new version protects only those who are certified to fight interior fires and have at least 15 years of service. Police officers would be covered for post-traumatic stress attributed to responding to a homicide or other death caused by humans, other than motor vehicle accidents. The PTSD coverage would be prospective, not retroactive. Senate Minority Leader Len Fasano, R-North Haven, said the coverage standard for post-traumatic stress made no sense. “Why are we focusing on the event rather than the ramifications?” he said. Supporters said the bill was a small step toward restoring workers’ compensation for mental trauma that was repealed in 1993. Duff said the cancer benefit is necessary because of the chemicals produced by the combustion of synthetic materials now found in every structure fire. Sen. Kevin Witkos, R-Canton, a retired police officer, was the only Republican to attend the press conference. “It’s about time we protect those who protect us on a daily basis,” Witkos said. The other Republicans to vote for the bill were Art Linares of Westbrook, Paul Formica of East Lyme and Tony Guglielmo of Stafford. The Centers for Disease Control, summarizing a long-term study of the incidence of eight types of cancer among firefighters in Chicago, Philadelphia and San Francisco, found a “slight, but statistically significant” increase in the risk for lung cancer and leukemia. It called for further studies. Keith M. Phaneuf contributed to this story.